“Travel when you are happy and travel when you are sad”, with this motto I bet you will never let yourself indulge into sadness and deep thoughts questioning about yourself or your life. No wonder you need to give time to yourself when you are not able to chose the correct path. By choosing our path, we chose our destination. This is what I need to do this time. That is, by choosing the path to Travel I choose for myself the utmost destination of ‘Being Happy’. This time I am travelling with my friends which are a group of six girls. To attain our inner selves and inner peace we decided to explore Amritsar district in Punjab which is one of the holy place for Sikh religion because it is a home to the most spiritual temple ‘Harmandir Sahib’ (known as Golden Temple). All girls and a trip, means lots of laughter and lots of gossips. ;-) We were all set for the trip. We opted for train journey this time. Our train had to leave from Delhi Railway Station at around 7’0’ clock in the morning. We were already added on Whatsapp Group. We all decided to wake up each other at 4 o clock in the morning and make a call to the one who is not replying. This was decided intentionally so that we don’t need to wait for anybody at railways station. Early morning and we are all one by one reaching the station. Train was already at the railway station. And we were checking in to the platform. But still ‘Puja’ has not yet reached. We were all calling her and scolding her. We all have already found our seats and settled our luggage in AC chair compartment of the train and Puja has still not make up to the station. Yes, the AC Chair compartment where we got the seats because we were so late in booking our seats. So it is always advised to get your train booking done in advance so that you get comfortable 1st AC and 2nd AC at least. After all the hustle and Puja’s arrival, we all seven including the train have started with one aim of Amritsar. We had lots of nonsense talks all over the way. We shouted, we laughed, we sung and we just forgot everything behind. We were all in mood to enjoy fullest. That’s how we maintained our excitement till we were about to reach. After lots of patience and wait of almost 6 to 7 hours in train, we had finally reached our destination Amritsar. As we stepped down from the station we could see lots of autos and rickshaws available. We didn’t need to run much to find the transport to reach our hotel. Public transports are easily available in Amritsar. Bargaining is possible but up to some extent only. All the public transport vendors have their fixed rates. So it is useless to wait for another one for reduced rates. We found a shared auto just outside the railway station of Amritsar. That auto can comfortably adjust all six of us and our luggage too. He charged us the price of Rs. 100 to drop us till our stay at Fern Residency, Amritsar. Fern residency was chosen by us because it is the best and closest location to railway station and other sightseeing places in Amritsar. We didn’t want to opt for our stay which is far away and could consume most of our time in travelling. The interiors of the hotel was cool and with all modern facilities. We also liked the room and the facilities available there. Room size was big enough and bedding was also comfortable. Food at Fern Residency is also decent. Though we didn’t spend much time at the hotel but whatever time we could spend was all good and enjoyed by us at the max. The transport facility to travel to any place of sightseeing was also easily available from outside the hotel. Also you can ask the hotel reception to arrange the same for you. Both ways are going to charge you almost same. Sri Harmandir Sahib also known as Golden Temple is the known holy Gurudwara in Amritsar. Amritsar is home to Hinduism and Sikhism both. Golden Temple is the spiritual place for Sikh Religion. The Fourth Sikh Guru, Guru Ram Das is the founder of Amritsar and the fifth Sikh Guru, Guru Arjan, designed the Harmadir Sahib such that it is built in the centre of Amritsar and the holy scripture ‘Adi Granth’ was installed inside. Sikhism no doubt is its origin religion, but it welcomes all men and women from all religion to worship and find peace. 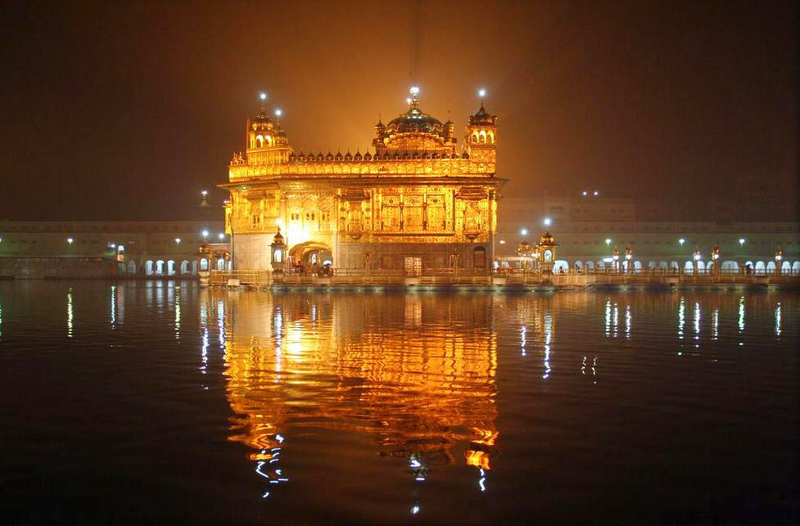 This temple is named so because the ceiling of Golden Temple is made of gold and precious stones. The structure is very elegant and beautiful. Coming to the maintenance of Golden Temple, Nothing can beat it. Very well maintained and up to mark cleanliness took my heart. People from different religion gather here to help. It is one of their gestures to devote themselves to god. In fact it is a proud feeling for Sikhs to serve in Gurudwaras. I do not belong to Sikh Religion, but still I love this gesture and served once at Bangla Sahib Gurudwara in Delhi. We had heard a lot about the visit to this place. Some advice to visit at night and few says the early morning time is the best. To keep us away from any confusion in future, we planned to visit both at night and early morning. Truly speaking, the peace giving positive vibes are same, whether it’s early morning or late night. The beauty by which it fascinates you is the same whether at its early morning or late night. Golden temple is very huge and is equipped with a small Pond inside. This Pond is believed to be a home to holy water and is properly cleaned at regular intervals. 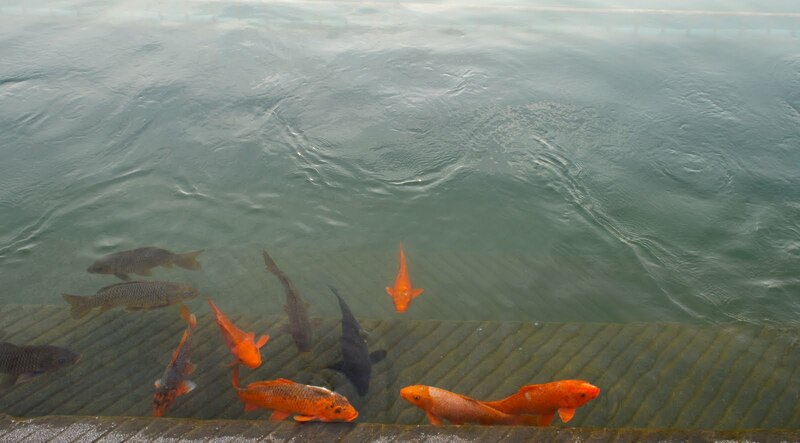 This pond is a home for many beautiful fishes too. Harmandir Sahib is also known as home to the world’s Largest Kitchen (also known as Langar). It serves free food to approximately 1,00,000 people every day. It is not just this Gurudwara that provides free food to People; in fact the entire Gurudwaras worldwide follow this tradition. a. Cover your full body even shorts are not allowed. b. Keep your head covered with some cloth. c. Shoes are not allowed inside. You need to remove them before entering. d. Wash your foot in a small pond which is available at the entrance. Please be noted, that there is no entry charges for the Gurudwara or any sacred place in India. Auto-rikshaw charged us Rs. 700 with return. Jallianwalla Bagh is very near to Golden temple in the same street I would say. You don’t need to plan your travel separately for the visit to Jallianwalla Bagh. It is the same place where Jallianwalla Bagh massacre or Amritsar massacre took place where the crowd of innocent people was fired upon by British Indian Army. Those people had gathered there to celebrate their cultural festival ‘Basiakhi’. 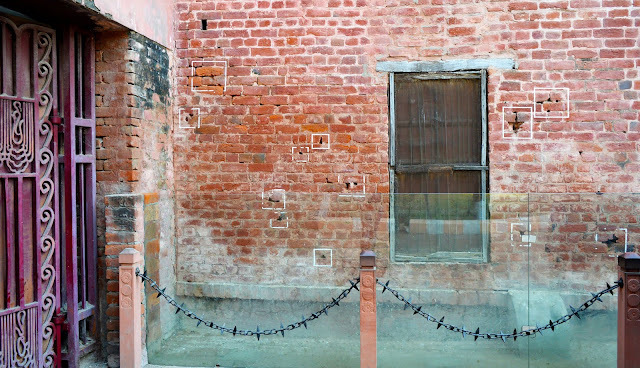 Bullet marks are still preserved there on the walls of Bagh and can be seen clearly. 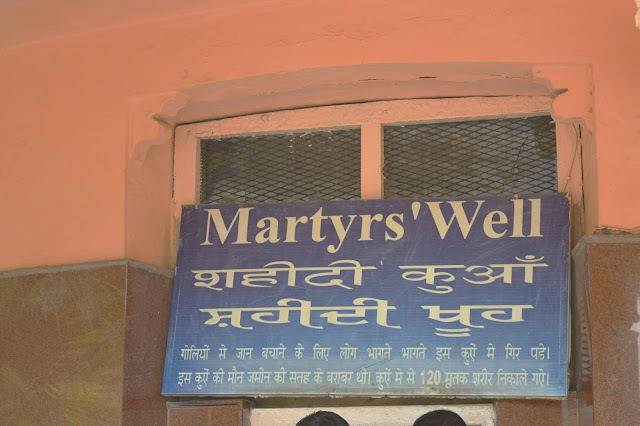 Another part of Jallianwalla Bagh to be taken into consideration is ‘Martyrs’ Well’. It is so because many people lost their lives by jumping into this well in order to protect themselves from firing. Wagah Border is a crossing located in between Lahore, Pakistan and Amritsar, India. 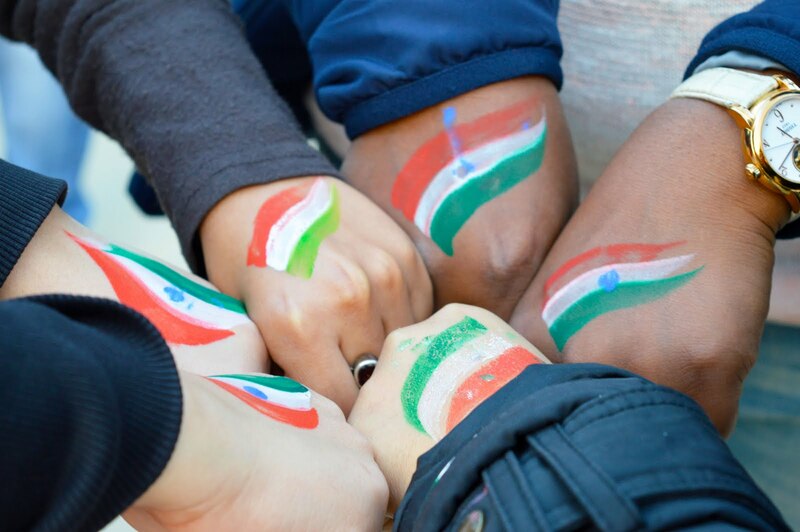 Wagah is actually a village in Pakistan and served as a good transit between India & Pakistan. Wagah Border is famous for the Wagah Border Ceremony that take place at the border gate which is conducted by the Indian Forces and Pakistan Forces. This ceremony is conducted daily and the visitors from varied states arrive to see the ceremony. This ceremony is a symbol of rivalry as well brotherhood between two countries. The ceremony is conducted every evening before sunset. Soldiers from both the side perform in the ceremony and as the sun sets, the gates from both the sides are opened and flags are lowered down. VIP Seating is the closest to the gates. You need to get these seats booked from BSF station in Amritsar Bypass road one or two days beforehand. These tickets will be given to you only on referral basis. Foreign Tourist Section available to foreigner only on the basis of their passport identification. For others there is a facility of big screen from where the ceremony can be seen live. 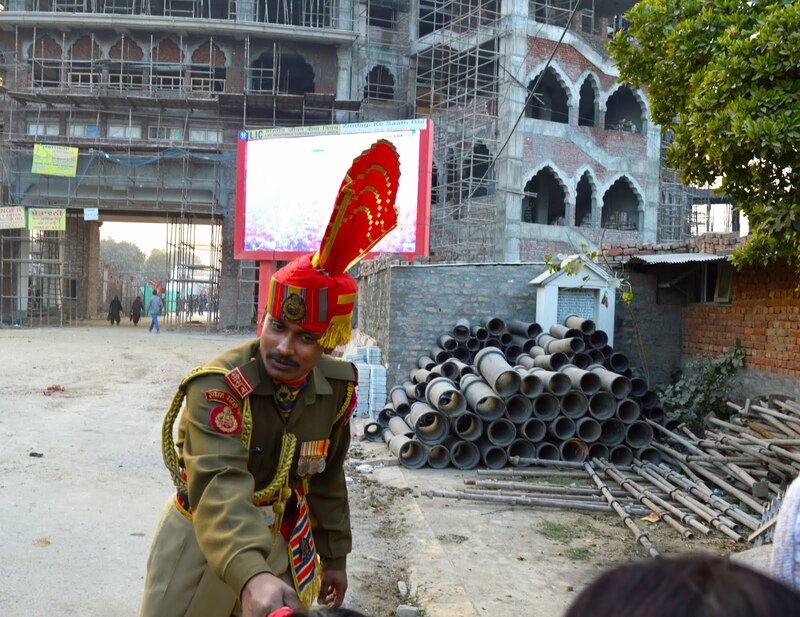 The Wagah Border was under construction at the time when we had been there in Dec, 2016. It took us approximately 45 minutes to reach Wagah Border from our hotel. 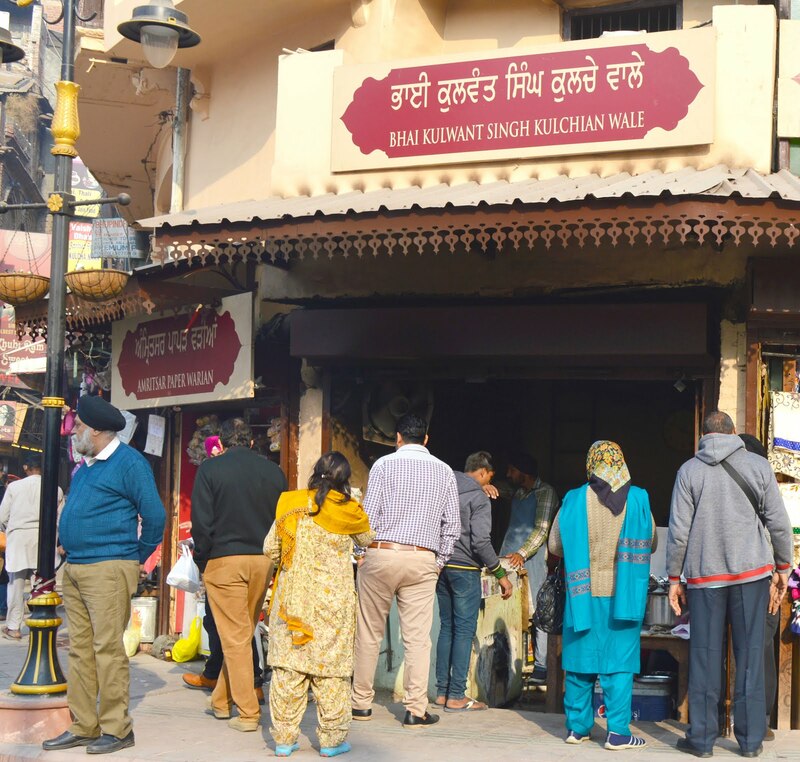 Cloth Market is another fascinating area that can be explored in Amritsar. It is famous for its Salwar Kameez and Dupattas in Punjabi style. We did shop many items from this market including Salwar Kameez, Dupattas and Amritsar’s Native Food Items. You can easily spend your 2 hours in this market. As we were all girls, even two hours was less for us. We had our return Train ticket otherwise we could have easily spent few more hours here. Kesar Da Dhaba is one of the most famous Pujabi Dhaba in Amritsar. It is running from a long time and many celebrities and politicians have had lunch at this place. Prices are not that high but whatever the charge, is on its name. It is mostly famous its Thali and sweets. Food is prepared in Pure Ghee and in pure Punjabi style with lots of Ghee. The place is almost full every time so waiting for your turn is required. Do not expect a luxury seating at Kesar Da Dhaba. As obvious from its name, the seating and interiors are in villagers’ style. Don’t forget the sweet dish after food. It’s a must to have as per my views. Kulwant Singh Kulchian Wala another famous place located near Golden Temple. It is not any big reataurant, but a small shop which is famous for its varied variety of ‘Kulchas’. Golden Temple Langar as already mentioned above is the world’s largest kitchen that can serve approximately 1, 00,000 people every day. It’s a must to have as per my views as a Prasad of Gurudwara. 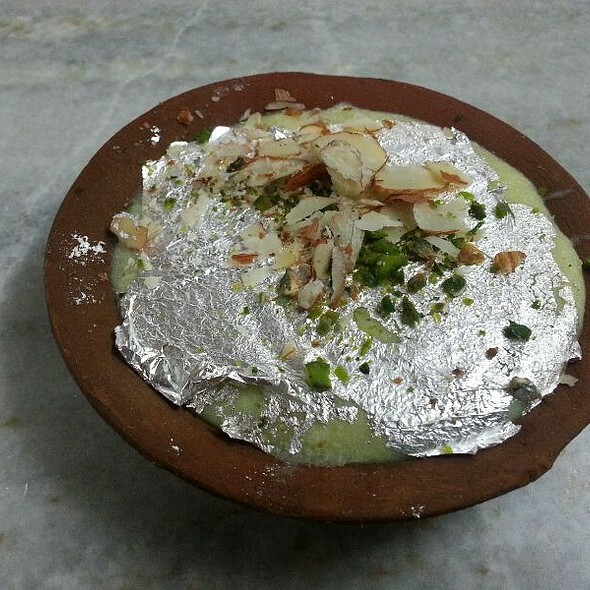 Prasad is believed to be a gracious gift of god in India. Brothers Ka Dhaba is another famous Dhaba in Amritsar serving similar to Kesar Da Dhaba. Pricing is reasonable here. This Dhaba is a partition of Two Borthers. Big Brother named its Dhaba as ‘Big Brother Dhaba’ and the Younger Brother continued with old name ‘Bhrawan da Dhaba’. Taste wise both are equal. The total expense that counts to sharing is mentioned below. Personal shopping expenses are not included in this. Total Expenditure for 2 Days and 6 people – Rs: 22,200/- that is 3,700 Per Person Approximately. This was all about our first spiritual and Patriotic trip to Amritsar. Stay tuned for few more of the kind. For once I have had the experience of the same type when I was on a tour with my friends. It was the one most fantastic tour that I have ever had in life for the first time.